In Charlotte, we saw a man run down peaceful protesters with his car in cold blood. He killed a woman and injured others. However, was it really a surprise to see this coming from somebody attending a rally full of people whose beliefs espouse hatred at a minimum and ethnic genocide at worst? The actions and sentiments behind the “Unite the Right” rally have seen condemnation from nearly all angles–both political parties, political leaders around the world. The only person who has not seemed ready to fully condemn the rally has been the person who should have been first to do so-the President of the United States. Trump initially sent out a statement blaming both sides–saying that the violence stemmed from both sides and the counter-protesters were the equivalent to the KKK members, white nationalists, and Neo-Nazis among the hard right supporters at a rally protesting the removal of Confederate imagery. The White House eventually issued a statement specifically condemning the KKK, Nazis, white supremacists, racism, and hate groups in general. However, it quickly became clear that President Trump did not stand by the White House’s follow-up statement after he held a press conference where he doubled down on blaming both sides equally. These statements came in the wake of Virginia governor Terry McAuliffe making statements that the “Unite the Right” rally-goers had stashes of weapons and battering rams throughout the city. Governor McAuliffe also noted, in response to the tepid response of the police to the violence from the rally, that the rally goers were armed with semi-automatic weapons and body armor better than the police. In the face of this, Trump’s refusal to condemn the neo-Nazis at the rally has drawn extreme criticism from nearly all sides. As part and parcel of this criticism, states have taken steps to show their commitment to combating white supremacists and neo-Nazis across the nation. The FBI has even begun an investigation into the rally and its organizers. However, perhaps the most substantial of these steps on behalf of the states has been out of Illinois last week–a law declaring white nationalists and neo-Nazis terrorists. The law was passed to show that Illinois stands “in total opposition to the hatred, bigotry and violence displayed by the white nationalist and neo-Nazi groups in Charlottelsville.” The law does a number of things. 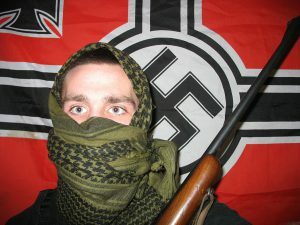 First, it officially resolves that Illinois “strongly denounce[s] and oppose[s] the totalitarian impulses, violent terrorism, xenophobic biases, and bigoted ideologies that are promoted by white nationalists and neo-Nazis.” Second, it resolves that law enforcement should treat white nationalists and neo-Nazi groups as “terrorist organizations, and…pursue the criminal elements of these domestic terrorist organizations in the same manner and with the same fervor used to protect the United States from other manifestations of terrorism.” Finally, it resolves to send a copy of the law to President Trump, as well as all members of Congress, the Governor of Illinois, and the Illinois General Assembly. What Will This Actually Change? To be honest, this law is primarily about making a statement. It has no framework for any actual legal application. However, simply saying that white nationalists and neo-Nazi’s should be treated as terrorists by law enforcement has some serious potential implications in the courts. At a minimum, this law will likely substantially ramp up the Illinois police’s commitment to pursuing and eliminating white supremacist and neo-Nazi hate groups within the state. However, while this is still a fresh law with no actual rulings on it in the courts, it certainly can implicate quite a bit when it comes to Illinois’ own criminal terrorism rules. Under Illinois law, acts of terrorism carry additional criminal penalties above and beyond what these groups might normally expect from their violent actions. What’s more, and this is potentially the biggest change Illinois’ resolution could create, Illinois law makes it a crime carrying between nine to forty years in prison to provide or solicit material support for terrorism. Material support include money, securities, lodging, training, safe houses, false documentation, communications equipment, facilities, weapons, lethal substances, explosives, personnel, transportation, or any other kind of physical assets or intangible property, expert services, or expert assistance. As you can see, this covers an enormous number of situations–situations that are essentially vital to the functioning of any organization. Depending on how literally you interpret Illinois’ new law, this could be an enormous blow to white nationalist and neo-Nazi groups in Illinois. It could very well add huge criminal penalties to being involved and providing any kind of assistance to these hate groups so long as the person providing assistance knows who they are supporting. Under Illinois law, it could even be a criminal act to conceal the existence of one of these hate groups. If this is the case, this could shut down the financial support to these groups–something that is incredibly important to combating white supremacists in Illinois and across the nation. However, any real effects of the law are far from confirmed, as of now the effect appears to mostly be a statement of intent on the part of Illinois. Even if this is all there is to this recent resolution, this is still important. Condemning the acts of white supremacy and neo-Nazi groups is something we should not just demand, but expect from politicians throughout our nation. Our leaders should not make excuses for hate and racism, we should demand more than that of those who represent us. « Parents: How High Does Your IQ Need to Be To Raise Your Children?